This was one of the most meaningful commissions for Harry Whitehorse, as World War 2 Navy Veteran and Ho Chunk Nation tribal member. 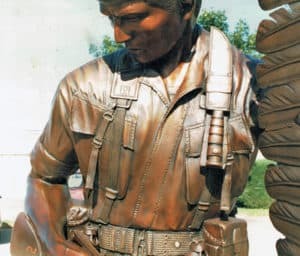 The park is home to the National Native American Vietnam Veterans Tribute dedicated in 1995 and bearing, in alphabetical order, the names of Native American troops from tribes around the country killed in Vietnam. They include Paul Pamanet, a private in the U.S. Army killed in action in 1968, and Martin Pamonicutt, a U.S. Marine killed in 1969. They are listed next to each other. Both were from the village of Neopit on the Menominee Reservation northwest of Green Bay.